Jasper Morris MW. has lived, breathed, bought and sold Burgundy since 1981. He has a home there, he makes his living there. He has built up over 30 years the kind of exact, on-the-ground knowledge that only someone based in the region can acquire. His is the knowledge built up year after year from visits to and conversations in producers' cellars both grand and humble, from walking through their vineyards observing the minutiae of viticulture, from studying the weather, the development of vintages in cask and bottle, the changing patterns of family and ownership. The book, in 656 pages, covers one thousand specific vineyards, from grands crus to obscure plots. Each is described and assessed, and the makers of its wines introduced and appraised. We learn why the top half of a certain vineyard inevitably makes wine of more character than the down-slope portion, how subtle choices in the vineyard, the cellar, even the cooperage make such differences to the quality of the final wine. The Wine Advocate - There is no doubt that this is an essential book for anyone remotely interested in the region and its wines. Jancis - Opening with a glossary, historical background and general overview of how wine is made in Burgundy, the narrative goes on to investigate each of the communes that make up the wines of the Côte de Nuits, Côte de Beaune and what is the greater Burgundian area. Each appellation is covered, with figures for acreage and the preponderance of grands and premiers crus, followed by a general overview of who owns what and how much. The genesis of particular vineyards and where their names came from, with biographical notes on the producers Morris deems the most important, coupled with their achievements, a brief analysis of their wines, along with detailed and useful accompanying maps, make up most of the package. In essence, this is a well-written, encyclopaedic investment that's hugely informative and as manageable as it gets when browsing the leviathan that is Burgundy. Parker - There is no doubt that this is an essential book for anyone remotely interested in the region and its wines. Decanter - Some features make this an indispensable book for a Burgundy lover' s shelf: coverage of Chablis and the Maconnais as well as the Cote d'Or; superb maps; succinct descriptions of vineyards (not just crus but many village sites, too); and details of the vineyard holdings of top estates. “To sum up, Jasper Morris has found a way to illuminate the bafflingly complex relationships between people and place, vigneron and vineyard, which are at the heart of Burgundy. Inside Burgundy is the greatest reference work of our generation – actually a number of generations – it is Dr Jules Lavalle for the 21st century generation. It is its own benchmark. 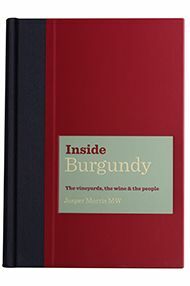 Inside Burgundy is well-written, with plenty by the way of personal quote and interesting little aside to break up the text, and so despite lots of detail on the wine-making techniques, it is never heavy going. It is also up to date and very free of errors. Above all, though, as I read I feel that Jasper is acting as my trusted guide through the complexities of this wonderful region. I think he really understands Burgundy - he 'gets' it - and this isn't always the case with people who write on the subject.